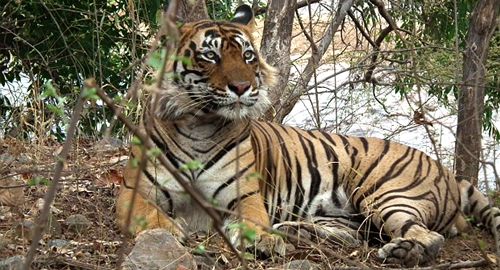 The tiger inhabiting in Kalapani area in Ranthambore National Park went missing on January 18, 2015. T-24 or Ustad, who is infamous for attacking human beings frequently, cannot be traced by forest officials since Sunday. T-24 AKA Ustad, a male tiger and the offspring of tigress T-22 Gayatri has been missing after he was noticed being unwell for some time. According to reports, T-24 was facing issues with defecation for past eight days. The reports also states that the male tiger was also not eating properly. Concerned with the severity of the condition, the forest officials at Ranthambore decided to feed him artificially through bait and also consulted the doctors, who were successful to resolve the problem partially. Even, feeding artificially was partly a success as the tiger consumed very little food, and since then only it went missing. According to Dharmendra Khandal, a conservation biologist, tigers suffer with defecation issue if they have eaten fur. He also stated that defecation can also be caused if any bone is stuck or if there is a tumour growing inside the tiger. The forest department is considering operating T-24 as soon as he is found. The tiger has undergone a surgery earlier also, when a thorn was stuck in one of his paws. About 15 forest officials are tracing the trail of T-24 at Route Number One, who is a dominant male tiger in Ranthambore National Park and acquires a large territory in Kalapani area that includes Jamoda, Chiri Kho, Singhdwar, Sultanpur, kala Plia Pani, Sonkachh, Futa Bandha, Rann, Mishr dara, Amreshwar.